The booklet focuses on the areas such as the development in the economy, the challenges in meeting monetary policy objectives and financial stability, monetary policy strategy and the policies for financial system stability in 2012 and beyond. Available in three languages. 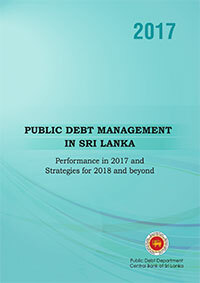 This annual publication provides a comprehensive insight to highlights of public debt management, servicing of public debt and operations in the Government Securities market during 2016. Further, it envisages the issues and challenges of the Medium-Term Debt Management Strategy 2017 - 2020 and the risk management of Public Debt. This publication provides a comprehensive coverage on Anti Money Laundering and Countering the Financing of Terrorism effort in Sri Lanka including legislative enactments, rules and regulations introduced during 2006 - 2011 and their practical applications. This is the 1st report of the Financial Intelligence Unit and will be released annually.